The Tax Committee Convenor of the Law Society of Scotland details the importance of Women in Tax. 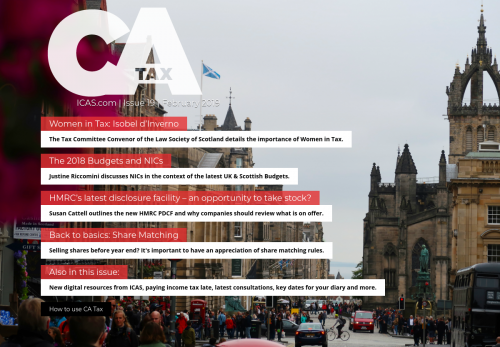 Justine Riccomini discusses NICs in the context of the latest UK & Scottish Budgets. HMRC’s latest disclosure facility – an opportunity to take stock? Susan Cattell outlines the new HMRC PDCF and why companies should review what is on offer. Selling shares before year end? It's important to have an appreciation of share matching rules. New digital resources from ICAS, paying income tax late, latest consultations, key dates for your diary and more.